From meditation studios to superfood lattes, the wellness industry is offering more products and services than ever before. With so much to choose from, it’s hard to know what’s worth trying and buying. 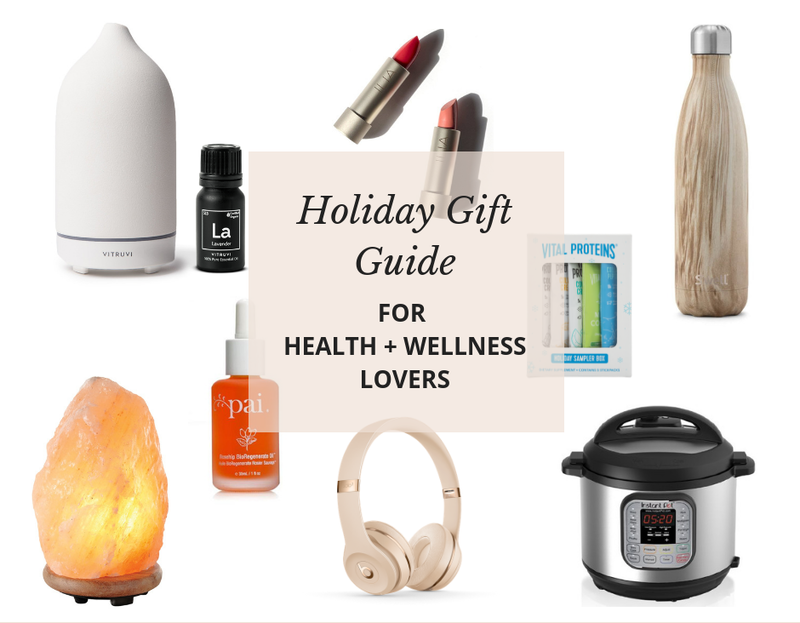 I put together this gift guide to help you navigate the wild world of wellness gifts for you and your loved ones. The holidays are stressful and we all need a little self care to balance out the craziness of the season. Self care comes in many forms depending on the person. This wellness gift guide has everything from natural makeup and skin products, to aromatherapy, high-powered blenders, gratitude journals, and wireless headphones. There is something for everyone! Shop my favorites in my very first holiday gift guide for health and wellness lovers. Don’t be shy about gifting yourself some goodies too. It’s the holidays…treat yo self! 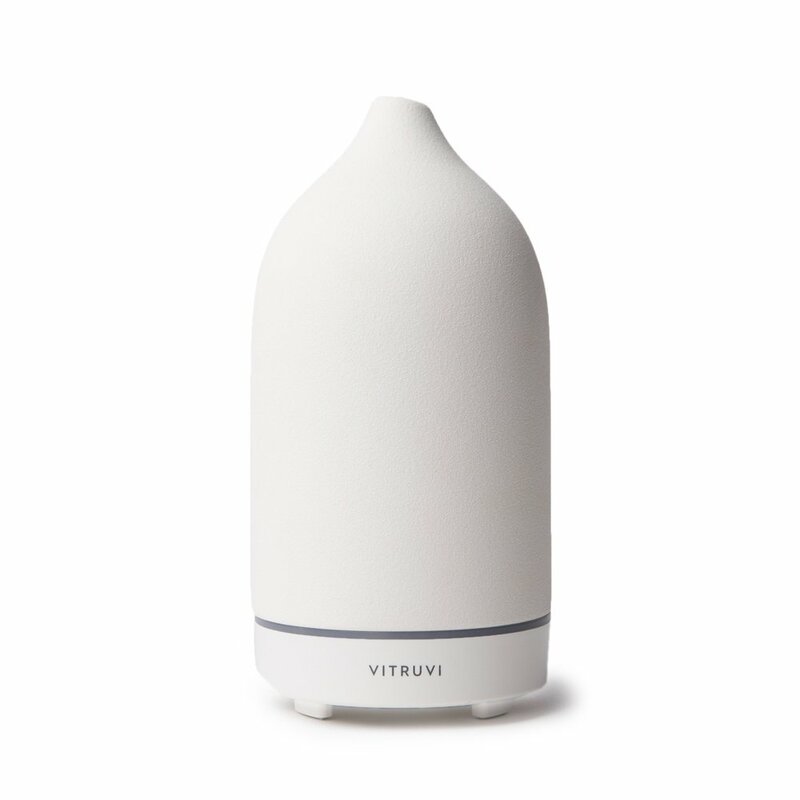 This ceramic essential oil diffuser is perfect for filling any room with subtle scents of your favorite essential oils. I love starting the day with an invigorating Eucalyptus and finishing it with a calming lavender. The 5-Minute Journal uses positive psychology to help you be more intentional, productive, and positive everyday. It would make a great stocking stuffer for anyone who wants to start 2019 strong with self reflection and intention. This Swell stainless steel water bottle is a great way to reduce your use of plastic, minimize exposure to hormone-disrupting chemicals like BPA, and increase your water intake. I like to keep one large bottle at the office and one at home so I don’t have to lug a water bottle with me on my commute. This one has a nice narrow mouth and body, which makes it easy to chug during a workout class. Set the mood with soft, amber lighting using this Himalayan Salt Lamp. It transforms any space into a calm and relaxing zen den, perfect for the bedroom or office. I also love this Himalayan Salt Night Light for the bathroom or bedroom. These wireless headphones are the perfect gift for your favorite workout enthusiast. It feels so luxurious to be able to take off a sweaty layer in the middle of a run without having to worry about chords getting caught. These come in a ton of stylish colors and also make a great fashionable and functional accessory for your commute. I’m obsessed with this gentle, exfoliating and moisturizing face wash by Tata Harper. This product is good for all skin types and eco certified. It leaves your face feeling clean and soft. The perfect winter moisturizing cleanser. The Pai Rosehip Face Oil is my go-to moisturizer in the winter. It’s affordable and leaves your face feeling moisturized, but not oily. Rosehip oil is packed with antioxidants and is especially good for fine lines. This Coco Rose Hydration set is your one-stop-shop for fighting dry winter lips, face, and skin. The products have a very subtle coconut and rose scent, and this holiday trio is a great intro into the Herbivore Botanicals products (I love so many of them). This RMS Luminizing Palette is the perfect gift for your favorite natural beauty junky. RMS is one of the best all natural make up companies out there and their highlighters are gorgeous! This set comes with every color. I personally love the Master Mixer - it’s great for a rose gold shine and blends beautifully with other products too. I’m loving the natural beauty products available these days and Ilia is one of my favorite brands. I love their tinted lip conditioners that use organic ingredients to condition the lips and give them a sheer lip tint that’s totally buildable for a bolder color. This gift set features their most popular colors. I’ve literally had my Vitamix for 10 years and it’s still going strong. This high powered blender can do everything - smoothies, soups, cauliflower rice, sauces, you name it. It’s truly the gift that keeps on giving. The Instant Pot will be your most useful kitchen appliance. It’s a rice cooker, yogurt maker, slow cooker, pressure cooker, and has a steam/saute function all in one little gadget. It’s a no brainer for your favorite foodie. It’s no secret, I’m a fan of collagen (read these posts for more on the health benefits of collagen and ways to add collagen to your diet). If you or your loved ones are like me and can’t seem to keep up with all the new and exciting products from Vital Proteins, this holiday sampler is the perfect little stocking stuffer. Matchaful is my favorite matcha brand at the moment. I went to their shop in SOHO, fell in love with their pumpkin flavored matcha latte, and never looked back. This organic matcha ritual set is perfect for your favorite matcha lover who wants to save some dough and start making matcha at home instead of paying for those pricey lattes. Their single origin organic matcha also makes a great stocking stuffer. Hopefully these products help you and your loved ones have a less stressful holiday. What are some of your favorite wellness products. I’m always looking to try something new! Leave your suggestions in the comment section. This post contains affiliate links, which means that All Great Nutrition may receive a small percentage of a product or service you purchase using the links in the post. You will pay the same price for all products and services, but your purchase helps support our ongoing work to help others be healthy and happy. Thanks for your support! the founder of All Great Nutrition, integrative health Dietitian, and National Board Certified Health Coach. I help frustrated dieters get back to feeling confident, empowered, and positive about their health. Want to transform your relationship with food and stop emotional eating? Contact me to learn more about my coaching program. Exercise and Mental Health: How much is too much?